Thinner than C-Lon Micro Cord, 8 lb Fireline, about the same as 8 lb PowerPro, but slightly thicker than 6 lb Fireline and 10 lb WildFire. Very good option for beading projects requiring a thin, strong thread that's completely smooth as it is very heavily bonded. This thread feels more flexible than Fireline, WildFire, similar to PowerPro, but not as flexible as C-Lon Bead Thread Size D, AA and KO/Miyuki Thread. A monocord construction like C-lon Bead Thread, Nyloo, KO and Miyuki bead Thread, but more heavily bonded. No stretch observed. Spools are 4.5 inch (11.2 cm) wide. 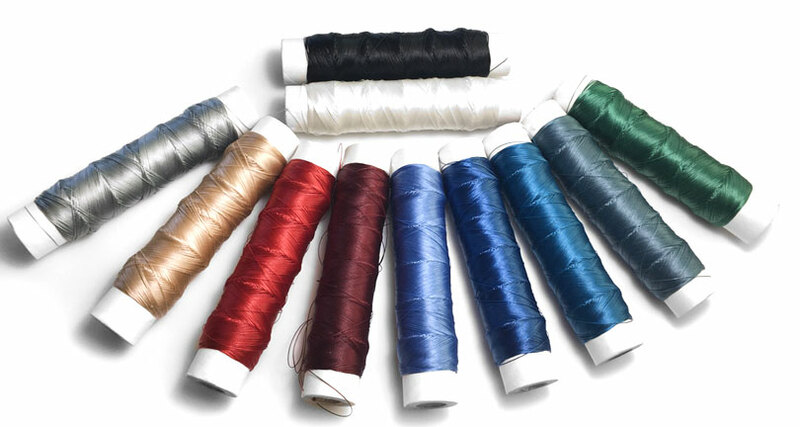 Personal Note - We are very happy to offer an alternative thread for your beading projects. This thread is very strong and incredibly smooth. The thread construction appears to be a monocord that's heavily coated. The thread is made out of synthetic fibers such a nylon, polyethylene, or Dyneema type of fiber, with a monocord construction, very heavily bonded. This thread came in large cones and we are transferring it to smaller spools with our new spooling machine. It is limited to colors and quantities in stock as it is no longer manufactured.